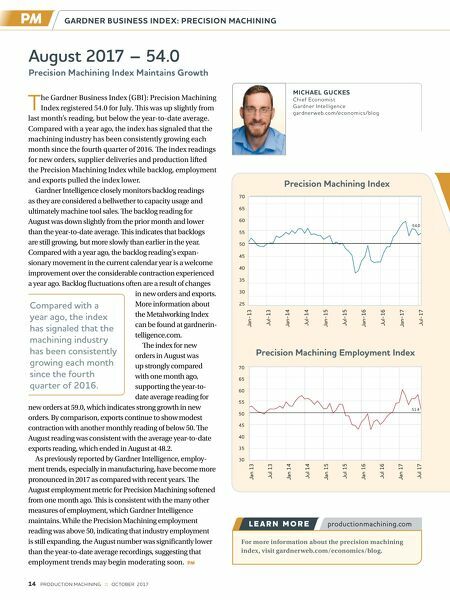 MICHAEL GUCKES Chief Economist Gardner Intelligence gardner web.com/economics/blog August 2017 – 54.0 Precision Machining Index Maintains Growth Compared with a year ago, the index has signaled that the machining industry has been consistently growing each month since the fourth quarter of 2016. Precision Machining Index Jan-13 Jul-13 Jan-14 Jul-14 Jan-15 Jul-15 Jan-16 Jul-16 Jan-17 Jul-17 70 65 60 55 50 45 40 35 30 25 Jan 13 Jul 13 Jan 14 Jul 14 Jan 15 Jul 15 Jan 16 Jul 16 Jan 17 Jul 17 70 65 60 55 50 45 40 35 30 Precision Machining Employment Index 54.0 51.4 GARDNER BUSINESS INDEX: PRECISION MACHINING 14 PRODUCTION MACHINING :: OCTOBER 2017 T he Gardner Business Index (GBI): Precision Machining Index registered 54.0 for July. is was up slightly from last month's reading, but below the year-to-date average. Compared with a year ago, the index has signaled that the machining industry has been consistently growing each month since the fourth quarter of 2016. e index readings for new orders, supplier deliveries and production lifted the Precision Machining Index while backlog, employment and exports pulled the index lower. Gardner Intelligence closely monitors backlog readings as they are considered a bellwether to capacity usage and ultimately machine tool sales. e backlog reading for August was down slightly from the prior month and lower than the year-to-date average. is indicates that backlogs are still growing, but more slowly than earlier in the year. Compared with a year ago, the backlog reading's expan- sionary movement in the current calendar year is a welcome improvement over the considerable contraction experienced a year ago. Backlog fluctuations often are a result of changes in new orders and exports. More information about the Metalworking Index can be found at gardnerin- telligence.com. e index for new orders in August was up strongly compared with one month ago, supporting the year-to- date average reading for new orders at 59.0, which indicates strong growth in new orders. By comparison, exports continue to show modest contraction with another monthly reading of below 50. e August reading was consistent with the average year-to-date exports reading, which ended in August at 48.2. As previously reported by Gardner Intelligence, employ- ment trends, especially in manufacturing, have become more pronounced in 2017 as compared with recent years. e August employment metric for Precision Machining softened from one month ago. is is consistent with the many other measures of employment, which Gardner Intelligence maintains. While the Precision Machining employment reading was above 50, indicating that industry employment is still expanding, the August number was significantly lower than the year-to-date average recordings, suggesting that employment trends may begin moderating soon. 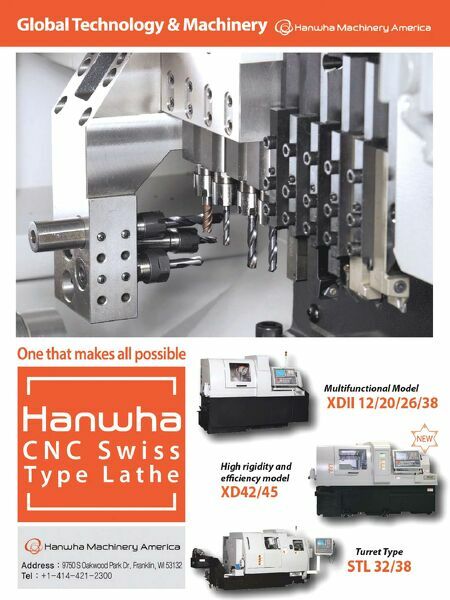 For more information about the precision machining index, visit gardnerweb.com/economics/blog.